It was early for us, too. This big ol' lion gave a big yawn just after this shot. This blog could easily have been one big photo album - and I was tempted to go in that direction. Or, I could written an "I can't believe I am seeing a real-life-lion-in-the-wild five feet from my extra-safe-safari-vehicle!!!!!!!!!" But If there is one thing I really, really can't stand it's multiple exclamation marks. One is always enough. Having said that - this safari was amazing!!!!!!!!! Okay, that's out of my system so now I can calmly share the highlights of our 12 day safari in the Serengeti with you. Good morning and welcome to my Kingdom. In a previous blog Safari at Last I was able to get my feelings about our first ever safari in April down on "paper". I committed my heart to that first experience and said that this second one would be wonderful, of course, but not as special as that very first one. However, love is a fickle thing. And now I realize our first safari was like a high school crush and this safari was the real thing. We booked our dates for mid-May which is definitely shoulder season in Tanzania. It could have easily rained most of the time, but that's when we were going tobe in Africa, so that's when we could go. Good news - it was considerably cheaper and less crowded than after June 1st and it only rained once. Even better news, we were the only two booked on the Wildland Adventures Serengeti Wilderness itinerary so we would have a vehicle and guide to ourselves. That cuts two ways, of course, since we'd be spending all day, every day, with just this one person. But it also meant we wouldn't be subject to group consensus or the personality quirks of fellow Safarians. We knew from the moment our guide Leonard picked us up at the Mount Meru hotel in Arusha that we were in good hands. It looked like he came directly from a "central casting call" for the role of Ideal African Safari Guide. He was a big man with a big smile and a deep, easy laugh. We were very happy this man would be our trusty driver, safari guide, road-trip companion, safety inspector, translator, provision provider and new friend. The one and only Leonard George, guide extraordinaire. He had a positive outlook and as far as he was concerned, he had the best job in the world and wanted nothing more than to be sure we enjoyed ourselves and had the best experience possible. His favorite phrases were "Hankuna matata", "easy pesa", "pole-pole" and "mombo poa, Mama!" In order that would be: "no worries", "no problem", "slowly, slowly" and "I've got you, Mama!" Along with those ditties we used the Swahili we'd picked-up in Zanzibar including Jambo (hello) Kwa Heri (goodbye) Asanta (thank you) Karibu (you're welcome) and Samahani (pardon me). Leonard also decided to call Michael "Mike" during the trip. That is something Michael usually nips in the bud right away, but somehow, coming from Leonard it seemed okay. I was Mama, Mrs. VIP, or sometime Deb-o-rah sung in baritone. We were so fortunate to have a great guide and a safari-mobile to ourselves. We piled our gear in the Land Cruiser for a 3 hour drive through dusty hills dotted with ragged villages until we came to the green edges of Tarangire National Park. We passed dozens of Maasai tribesmen and young boys shepherding large herds of cattle, goats and donkeys along (and often across) the highway. Finally we turned down a long dirt road that led to our first camp. Within minutes we were passing clusters of zebra, giraffe, impalas and warthogs. And we hadn't even started our official safari! We saw many Maasai people during our twelve days in Tanzania. Often we'd see women and children carrying firewood or water along the side of the road while the men and boys herded cattle. We checked in at Maramboi Camp and had a quick lunch before heading to Tarangire, our first of three Tanzanian National Parks renowned for it's elephant population. We soon realized that Leonard was not only a good companion, he was a very knowledgeable and experienced guide. He seemed to know just where to find animals in each vast park and pointed out birds and plants all along the way. In addition to his other talents he could also make a variety of wild animal sounds and bird calls. A happy elephant family on their way to greener pastures in the Tarangire Park. We headed back to camp tired but energized by the day. Dinner was a full spread of delicious African specialties served family style at our table - but we were almost too tired to eat. The next morning, Leonard had us up at dawn for breakfast and off to the park. We returned for a lovely lunch and a nap, and then it was back out for a late afternoon drive returning just in time for dinner. It basically went like that for the entire trip. It was so nice to be doing something so different - and a nice break from trip planning, cooking and schlepping our bags. Ready for a trek to the lake from our luxury tent at Camp Maramboi. We stayed in four different types of accommodation if you count the first night at the excellent Mount Meru hotel in Arusha. The next two nights were spent at Maramboi, a permanent tent camp with a pool and beautiful alfresco dining area. Our "room" was a large canvas tent with hardwood floors, an en suite bathroom and a deck facing the Rift Valley Escarpment. It was just like you'd expect a comfortable safari camp to be, and best of all there were zebra and wildebeest just outside, and swaths of pink flamingos on the lake in the distance. We were never sure what animals we'd find outside our door. 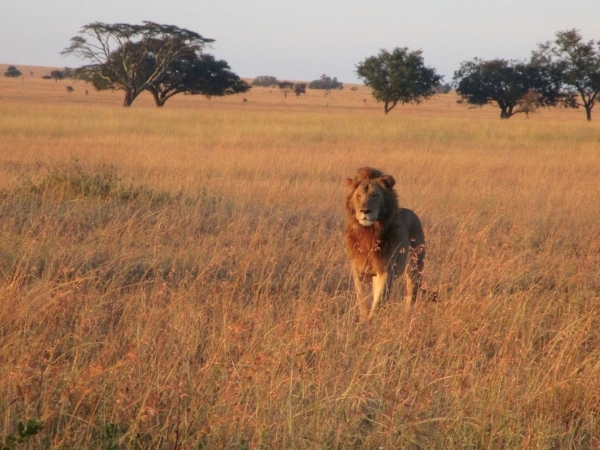 On the first night a lion killed an impala within earshot. We traveled a few hours up into the mountains to spend four nights at a lovely hotel called The Ngorongoro Farmhouse set in a valley with it's own coffee plantation. That was base camp for our time in the majestic Ngorongoro Crater and our visit to the Hadzabe tribe - more on that later. The third stop was a four night stay in the remote Kati Kati Tented Camp in the Serengeti. That was an interesting experience! First of all, because the camp makes a few seasonal moves based on the migration, our accommodations were "actual" tents. You had to be escorted to and from your tent after dark, and in the early mornings, so that the hyenas and lions didn't confuse you with dinner. We took "bucket" showers - that meant you stood in a closed off corner of your tent with a shower head poking through the top. A staff member stood outside and used a pulley to hoist a large canvas bag full of hot water to the top of the tent, and, when you were ready you shouted "Go!" and whoosh, down came a very welcome shower. You could smell these hippos well before you found them in their wallow. A group of hippos is called a bloat - how appropriate. Each national park offered different terrain as well as different animal and bird sightings (we got into birds). Michael kept track of what we saw each day and put together the staggering lists you'll see below. We saw multiples of most everything other than the hard-to-find black rhino and leopards. In fact, we had more than our fill of zebras, giraffes, elephants, hippos, wildebeest and a sweet little antelope called a Tommy, whose fate was to be a ready source of protein for lions, hyenas and cheetahs. We saw plenty of those, too. Let's move! Wildebeest, zebras and Thompson's Gazelles starting on "the great migration". This looks like a op-art painting! A herd of Zebra can also be called a dazzle - I love that. The most amazing animal experience we had during our twelve days was watching the zebras and wildebeest in The Serengeti come together en mass to began their annual migration north. According to Leonard we were fortunate to see this because most often these animals would already be well on their way, but cool weather and a continuing grass supply held them back. We were able to watch what seemed like thousands of animals form into thick ropes that stretched for miles. Sometimes they walked single file according to species, other times they intermixed. And often they were joined by frolicking Thompson's Gazelles who tag along for half the journey. As for best game viewing, we were staggered by the wildlife we saw in the Ngorongoro Crater. It was one big, deep, green bowl full of animals! Some lovely Maasai ladies who patiently showed us how to use beads, grind corn, thatch a roof do a dance, and buy a bracelet. We were able to visit three tribal communities as well - and Wildland did a good job of avoiding touristic "villages" where it was all about photos and souvenirs. We visited a small Maasai village where we did some beading and some very clumsy dancing and shared cookies with the children. While it was interesting to get a glimpse of how they live, it was also awkward because it felt voyeuristic to us. Later in the week we had a unique opportunity to join Hadzabe tribesmen on a dawn hunt in the bush while the women gathered roots and berries. This hunter gatherer society live pretty much as their ancestors did in small, nomadic family groups under huge Baobab trees or in rudimentary twig huts. Again, fascinating to observe, but awkward. The final visit was to the Datoga tribe, a semi-nomadic people who graze cattle and are known for creating beautiful jewelry from scraps of metal melted down and tooled into bracelets and earrings. My take away from these brief glimpses of tribal life is conflicted. First, it was difficult going from keenly observing animals in the wild during the morning, to doing the same thing with humans in the afternoon. The experiences seemed to blend together and it was hard to know how to switch gears and interact in a way that didn't resemble watching a family of elephants. There isn't any possible way to imagine yourself in their situation - or consider what it would be like to have a group swing by your house to peer in the windows and take pictures of each other helping you make a "traditional" breakfast! However, I will never forget the experience and came to the conclusion that every human has the right to determine how they live without judgement. Michael's most rewarding cultural experience was attending a rousing church service with Leonard in a small village near Ngorongoro. He was the only white person in the room but felt very welcome and accepted. On a hunt with Hadzabe tribesmen. Eventually they rousted a marmet from it's lair and added it to the strings of birds shot down with poison arrows. A Hadzabe shelter that will be left behind when the group moves on to new hunting grounds. Gentle giants wandering the flower covered floor of the Ngorongoro Crater. We left our new friend Leonard after he drove us eight hours back to our hotel in Arusha. We promised to stay in touch because we had a great time helping him come up with some name ideas for his own safari company and penciled out a few ways he could get started. Plus I'll need to hear "Hankuna Matata Mamma!" and "Pole Pole." every now and again. The entire experience was indeed worthy of the hyperbole that comes with the world Safari. It was worth the anxiety over planning and logistics and every penny of the "once in a lifetime" expense. So if you ever get the chance - follow your animal instincts and go for it.